IAS Inc., a Wisconsin-based systems integration company and Visual Components customer, recently told us about a unique project they completed for a Fortune 500 agricultural company — automating a seed-testing lab. What started as a project to automate a single task soon grew into something much bigger – finding a way to automate the entire seed-testing lab. The objectives quickly became much more complex and multi-faceted. There was also an issue with data integrity. The customer needed greater confidence in the data that was being acquired and tracked on each seed batch. 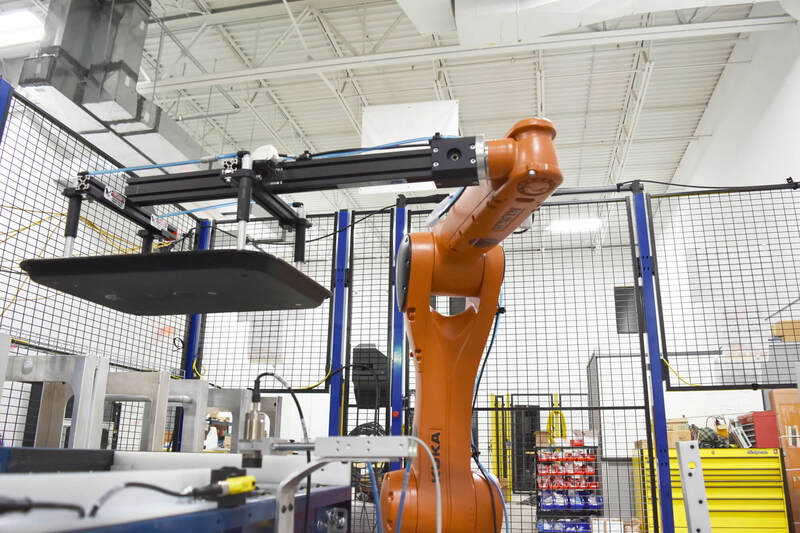 As the testing process procedures were highly repetitious and subject to demanding control parameters, they were great candidates to take advantage of the precision and efficiency of robotic automation. IAS started the project by visiting the customer’s seed-testing lab to talk with workers and key personnel on-site. IAS quickly learned that each operation area at the lab was dependent on each other, so it was key for them to start by breaking each area into modules and laying out the central architecture. Once the engineers had this complete, they could divide up the work more effectively while maintaining the central control framework. To help validate this concept and explain it to the customer, IAS used Visual Components 3D manufacturing simulation software. “Using Visual Components to create layouts and simulate our designs, we were able to fully showcase the creativity and capabilities of our team to the customer,” said Kyle. Visual Components also helped with keeping the momentum going early on in the project and improving communication. “The ability to present simulations and virtual models of the system’s operation to the customer, get feedback, and quickly make adjustments to the designs; really helped to streamline the feedback loop,” said Kyle. The solution IAS delivered for this project consisted of six key stations: unloading trays, un-jarring seeds from containers, applying seeds, inspecting the seed grid, tamping seeds into position, and loading control carts. The process begins at the tray unloading station. In the meantime, seed-filled jars are fed to a robotic un-jarring station, where a robot removes the jars from the carts, unscrews the lids, and then places them on a dual-belt conveyor. 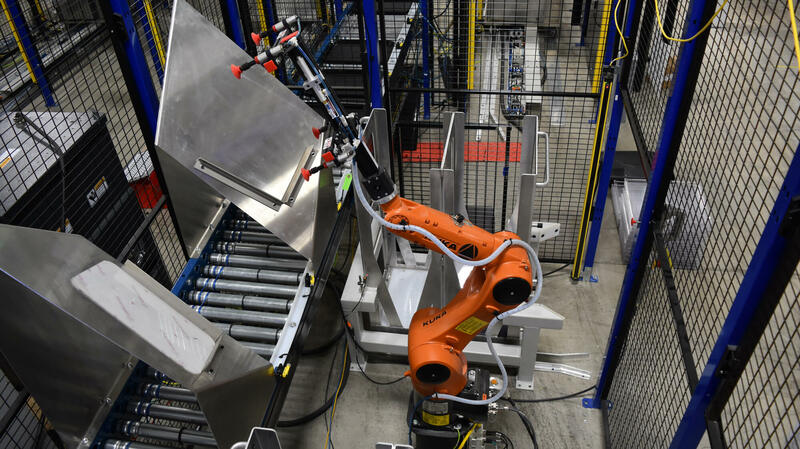 The conveyor brings the jars to another robot that lifts and pours the seeds into a dispensing system. The empty jars are then placed back on the conveyor system and sent away. At the seeding station, a dispensing system evenly rolls seed onto the trays in a 10 x 10 pattern. The trays then move on to an inspection station, where they are imaged to verify that the seeding pattern is correct, and any non-seeds or defected seeds are detected. A picking robot then replaces non-seeds and defected seeds with additional seeds from the same batch, and adjusts seeds on the trays to ensure they fit the pattern. Designing the inspection process was one of the more technically challenging aspects of the project. After the inspection process, trays are sent to a robotic tamping station, where seeds are tamped down on the trays. The trays are then sent to a robotic carting station, where they’re loaded onto carts and indexed. Once filled, the carts are taken into control rooms for the seeds to germinate. After testing, empty trays are carted out of the control room and robotically unloaded, imaged, washed, and reloaded into the same carts that are able to re-enter the system at the start of the line. The entire process runs two shifts, Monday through Friday. We used machine learning to solve these problems. Our vision team trained a neural network around the parameters of the seed set and we saw great results once we deployed it in the system. The completed in-line system was comprised of 12 robots, 13 cameras, and various RFID read/write areas. An additional 15 integrated cameras were utilized to monitor cart activity at the control room entries. IAS designed a tailored automation solution for this customer’s seed testing process. The result of the project was an increase in throughput and reduction in labor costs. In addition, IAS succeeded in giving their customer confidence in their data. IAS was able to offer a complete engineered solution. This included, electrical and mechanical system design, programming, testing, build, and installation. 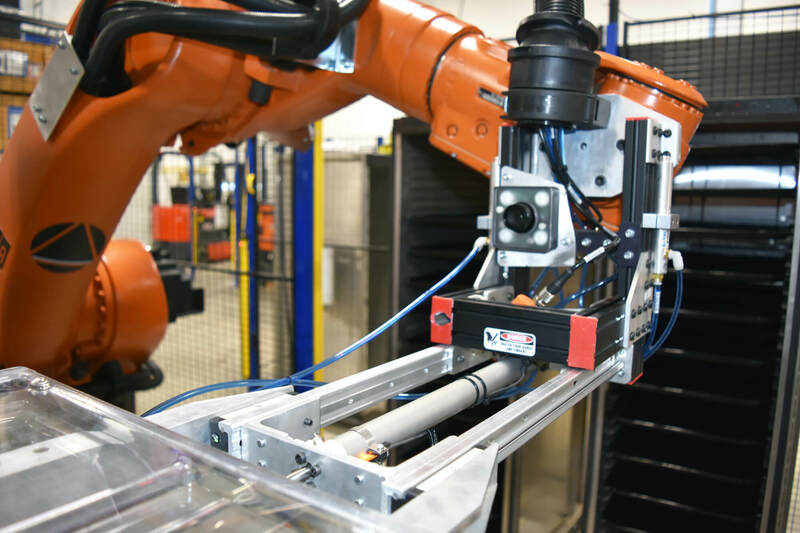 Check out the latest additions from KUKA, Yaskawa, Exechon, Mecademic, Rethink Robotics, Denso, Kawasaki, OTC Daihen, Fanuc, Mitsubishi and Comau!